ONE UNIT. Understand your role. Never be selfish. Play as a team. Simple goals that all coaches preach to start a season, yet few teams truly achieve these objectives. The No. 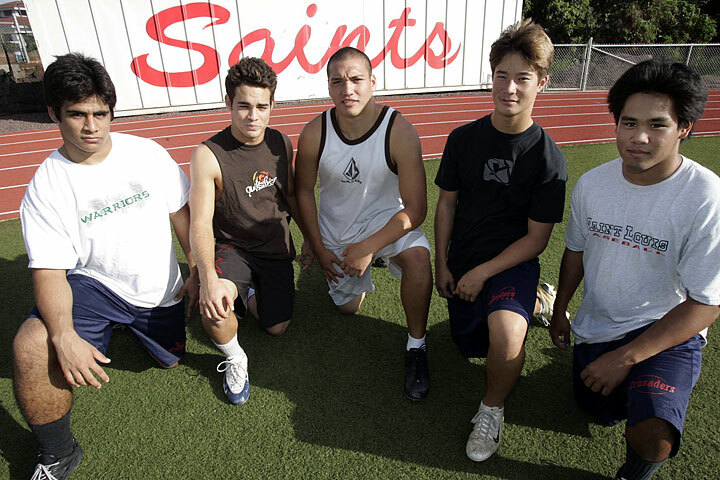 1-ranked Saint Louis Crusaders, led by their basic defensive philosophy and cohesive defensive unit, thrived under these unwritten football laws and won their first league championship since 2003. "Our players do a good job of playing together and knowing their role," coach Delbert Tengan said. "No one makes all the plays on our defense and we don't rely on any one guy and that is what it takes to have a successful season." Defense has long been said to be the key component to a championship football team. In the highly competitive Interscholastic League of Honolulu, teams that can't play defense will be exposed. ILH programs are too athletic and too well-coached for a defense to play poorly and still survive the gauntlet of top competition. A casual observer might assume that in order to overcome the prolific aerial attack of Punahou and the rugged ground game of Kamehameha, Saint Louis (10-0) must be drawing up creative schemes. Multiple formations. Zone blitzes. Stunts. Cover 4. Not so, said Crusaders defensive coordinator Jacob Yoro. "Our defense is pretty vanilla, we basically line up and try to play fast," Yoro said. "There is no disguise or trickery, we just play basic schemes and try not to confuse ourselves." SAINT LOUIS EMPLOYS a basic four-man front and man-to-man coverage. Scott Smith and Solomona Aigamaua are the top defensive-end duo in the state, giving the Crusaders the enviable advantage of generating a natural pass rush without having to blitz. This allows their linebackers and secondary to use their speed to fly around the field and make plays. It is a common defensive package that many teams run variations of across the state. So what is the key to the Crusaders' top-ranked defense? "First and foremost, we stop the run," Tengan said. "Our main goal is to force our opponent into third-and-long situations and take away what they do best." By doing this, Saint Louis is able to put their opposition in predictable passing situations and severely shrink the playbook. Defenses that can take away large portions of the offense's playbook are playing with a huge advantage. Granted, all of this is much easier said than done and none of these philosophies is a secret. Talent, coaching and heart have propelled Saint Louis to be the top defense in the ILH, giving up only 58 yards per game on the ground. On top of that, when facing Division I foes Kamehameha and Punahou, the Crusaders yielded 108 total rushing yards over four contests. Saint Louis finished the ILH regular season as the defensive leader in rush defense and yards per game. "The coaches just tell us to follow our assignments and don't miss tackles," senior defensive back Jeff Kahler said. "Every day before practice we watch films and we feel like we are always prepared to play each week." The preparation paid dividends in the most competitive league in the state. Coming off last year's loss to Punahou in a playoff to break a three-way tie, the Crusaders finished this season undefeated, but just barely. In the four games vs. their Division I foes, Saint Louis won by a total of 19 points. "We have been playing great defense when it counts," Tengan said. "In the Punahou game, we were up by over four touchdowns and obviously changed our scheme to prevent the big play. Unfortunately, we gave up a couple, but our defense made the plays late in the game when we needed them the most." IN THE END, coming up with a defensive stop is what led Saint Louis to the title. Statistically, one could argue the Crusaders were not even the best defense in their own division. Kamehameha led the ILH in giving up the fewest points per game. However, in the two hard-fought defensive battles between the Warriors and Crusaders, it was the Saint Louis defense that came up with the big plays in the fourth quarter that eventually led to victories and a return to ILH prominence. "No one on this team has won before at this level," senior linebacker Jacob Barit said. "All of the past champions are gone, and to be back on top feels great." Barit, a 6-foot-2, 220 pound blazing-fast linebacker, is a defensive leader for the Crusaders who has scholarship offers from San Diego State and Utah. He is attracting interest from California, Washington and Arizona State, among others. He, along with Smith and Aigamaua, are the only Crusaders with Division I offers. The major separation of top-flight talent between Saint Louis (which won 13 straight Prep Bowls between 1986 and '98 along with state titles in '99 and 2003) and the rest of the state has diminished in recent years. This is not a knock on current players and definitely not a cry of poverty, but the days of walking onto the field and overwhelming the opposition on pure talent alone are gone. All victories are sweet, but they mean a little more for the current Crusaders program. "WE DON'T HAVE as many dominating players top to bottom," Tengan said. 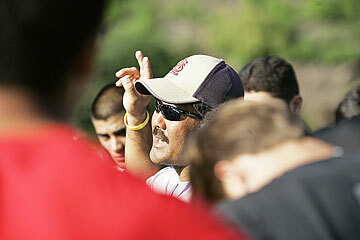 "Our last championship team, with Jason Rivers, Timo Paepule and Wilson Afoa had major talent. It's a great sense of accomplishment for the coaches and gratifying to see these kids develop and get better each week." "We are proud to go undefeated with as tough a schedule as we faced. It's an accomplishment that hasn't happened for us in a long time." That tough schedule will only increase with the state tournament up next for the top-seeded Crusaders. Tengan knows that his team will need to take it to a higher level because elite teams with talent and confidence are waiting to pull the upset. "Our No. 1 key is to move on from the regular season, because that's over now," Tengan said. "This is one game and you're out, so we need to continue to work with purpose. Our offense needs to play efficient and limit turnovers and we can be there in the end." They know the Crusader defense will.